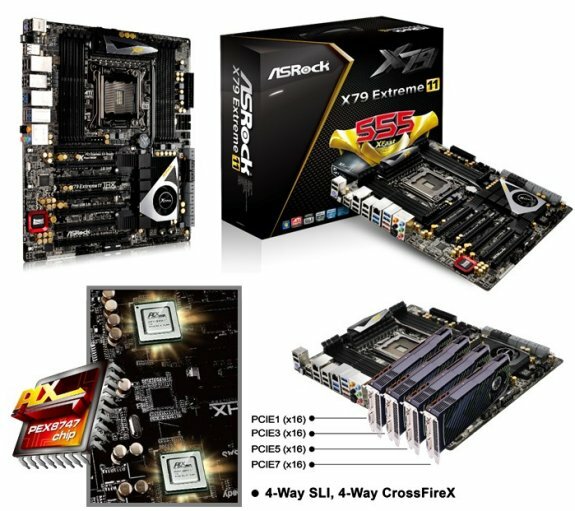 ASRock introduced a new X79 flagship, the X79 Extreme11. This mainboard offers 4-way SLI/CrossFire X support thanks to a PLX PEX 8747 bridge chip, eight SAS/SATA3 ports, Creative Sound Core3D audio, etc. ASRock is hitting the top end of Intel's motherboard chipset. This is ASRock's top-end board for a top-spec desktop chipset. The brand new X79 Extreme11, like most of ASRock's latest boards aimed at the enthusiast end of the market, is full to the brim with features. PLX PEX 8747 bridges let this board to run multi-GPU 4-Way SLI/CrossFireX in full x16 PCIe 3.0 speed, 8 SATA3/SAS ports (sourced from LSI™ SAS2308 controller) support LSI™ MegaRAID®, delivering 3.8 GB/s high transfer speed in RAID 0 mode, Creative Sound Core3D 7.1 CH HD Audio brings astonishing sound experience to user. This is a rare, superior motherboard that brings all luxurious components together, delivering the highest level of performance. "Full to the brim" is a bit of an understatement. ASRock X79 Extreme11 is a slot-happy motherboard, equipping with 7 PCIe 3.0 x16 slots, supporting up to 4-Way SLI/CrossFireX multi-GPU settings. To control them well, ASRock also employs the service of two PLX PEX 8747 chips to supply enough extra PCIe lanes to support everything. With the extra PLX silicon, users can run a four-card SLI/CrossFireX setup at full x16 PCIe 3.0 speed simultaneously. The X79 Extreme11 is a premium motherboard using luxury material, applying high-class specification. ASRock X79 Extreme11 provides 10 SATA3 ports, 8 of which are SAS ports sourced from LSI™ SAS 2308 controller. Via LSI™ MegaRAID® utility, users can get high transfer speed 3.8 GB/s through 8 SSDs in RAID 0 mode. Another added bonus is the Hardware RAID support. This really benefits users to fine tune their rig effortlessly. For audio aspect, the onboard Creative Sound Core3D quad-core sound and voice processor offers true-to-life sound experience, supports THX TruStudio PRO™, CrystalVoice, EAX 1.0 to EAX 5.0 and Scout Mode™. Another feature really stands out here is PHA (Premium Headset Amplifier). It provides wider bandwidth, higher slew rate with lower noise and distortion and supports up to 250 Ohm high-end headsets, which delivers crisper audio into the users ears. There're lots premium hardware goodies on the board. Luxurious components include a heavy 24 + 2 power phase design, Dual-Stack MOSFET, Digi Power and Premium Gold Caps that delivers current to CPU Vcore more efficiently and smoothly. 8 DDR3 DRAM DIMMs that can be overclocked to extreme 2500+MHz. New-in features of UEFI options are "Interactive UEFI" and "Easy RAID Installer". ASRock Interactive UEFI is a blend of system configuration tools, cool sound effects and stunning visuals. The unprecedented UEFI provides a more attractive interface and brings a lot more amusing. Easy RAID installer can help you install the RAID driver easily without floppy drive. It can copy the RAID driver from a support CD to your USB storage device with just one simple click in UEFI setup. Like all ASRock high performance motherboards, ASRock X79 Extreme11 is no exception, with a good set of overclocking settings in the BIOS and plenty of hardware options on the board. Again, ASRock brings a lot of power and features expertly crammed into a compact board – X79 Extreme11 will surely satisfy all enthusiasts' needs pretty much!